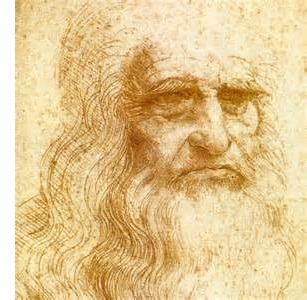 Leonardo da Vinci (1452-1519) - Along with Michelangelo, Leonardo da Vinci is one of the two figures more commonly associated with the Renaissance in Europe. He was a true polymath, excelling in multiple fields; a painter, sculptor, inventor, engineer, musician and mathematician, among other things. In fact, some have called him the most multi-talented human being who has ever lived. He was Italian, born in the little town of Vinci (thus the name da Vinci) about 25 miles west of Florence, in the region of Tuscany. Born out-of-wedlock to a wealthy Florentine, Ser Piero da Vinci, and a peasant named Caterina, not much is known about Leonardo's early years. In his copious notes, Leonardo mentions few events from his childhood. One involved stumbling upon a cave in the mountains outside his village. He recorded being both afraid that a monster might live inside, while at the same time being drawn by an almost irresistible desire to find out if one did (he doesn't say whether or not he entered). His study as an artist began in 1466 at the age of 14. The great artist, Verrocchio, accepted him as an apprentice in his workshop, the most prestigious in Florence. Da Vinci's talent quickly became evident. One of Verrocchio's well-known paintings, The Baptism of Christ, was supposedly a collaboration with da Vinci. The story goes that Verrocchio was so impressed by da Vinci's work on the painting that he put down his brush and never painted again. By 1478, Leonardo had opened his own studio and was earning a living on his work. In 1482, he moved to Milan where he worked for Duke Sforza. It was about this time that he began to expand his interests into other fields. Besides his paintings, da Vinci is famously known for his interest in flight. He studied the flight of birds and made drawings of machines that might allow humans to fly. As the two greatest Italian artists of their time, I was personally curious to know what interaction (if any) Leonardo da Vinci and Michelangelo had with each other. It turns out in 1503 the two were commissioned by the Guild of St. Luke to paint companion pieces known as The Battle of Anghiari (da Vinci) and The Battle of Casina (Michelanelo). Both works are now lost. Then a year later, da Vinci was on a committee which voted to relocate Michelangelo's David from Florence Cathedral to a public square outside Palazzo della Signoria; much to the dissatisfaction of Michelangelo. Among da Vinci's best known works are The Last Supper and Vitruvian Man, which is an iconic drawing of human proportions. But topping even those two is the Mona Lisa, which is perhaps the most famous painting in history.